PHONING IT IN, The Beach, mid-afternoon (NNN) — With the vice-presidential buzz and the Democratic convention just days away, what’s most important is what Barack Obama’s campaign does afterwards. Quite simply, he needs to create a more compelling narrative on change and get angry about something. Our ratings depend on it. It’s August, dammit. How many stories about cute puppies can you run? Attack ads! Push polls! We need material! We need the argument that this is an election with two choices — not just one popular dynamic guy and one old past-it guy. That’s not a compelling media narrative! Obama’s 2:1 advantage in the Electoral College is far too confusing for our viewers. We need to re-run polls until we get one with a 1% change, never mind the 3% error margin. It’s so close! Experts say it’s a wake-up call! Better keep your eyes glued to the screen! Oh my goodness! 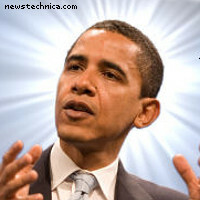 If Obama can just pull ahead between now and November 4, he may become President Barack Obama … Or not! Who knows? You need to keep watching! Right here! Stay tuned! Friday must be your editorial day. I’ll vote for him if he can show me policy worth squat. Not a single country in the history of this planet has become more successful by “taxing more”. And his health reform dribble is the same that First Lady Hillary Clinton had proposed in the first 8 months of Bill Clinton being elected in 1992, which had led to a rapid decline in the stock markets, until it became clear that that would not become a real bill. Obama’s application of social media is much better than competition but I hope voters will read a little before casting their vote. I’ll vote for him when…what am I saying, there’s no way I’d vote for this dude.